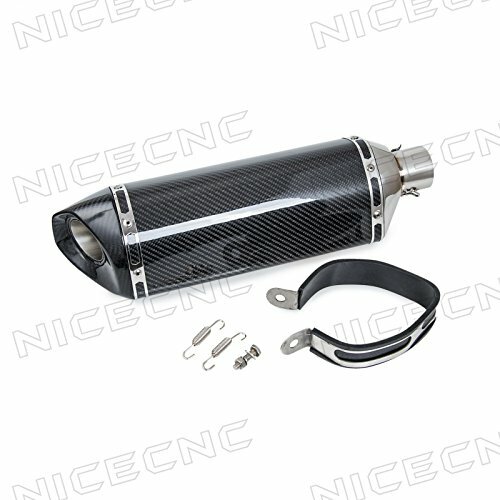 NICECNC 135 460MM ALL Carbon Fiber Hexagonal Slip-On Exhaust Muffler for 250cc-up Racing/Street/Sport by NICECNC at Chosen Hubs. MPN: NICECNC-ME002C-CX. Hurry! Limited time offer. Offer valid only while supplies last. 51mm Slip-On stainless steel inlet joint and feature carbon fiber right-side ''bevel'' outlet cap,with DB Killer internal noise reduction insert. 51mm Slip-On stainless steel inlet joint and feature carbon fiber right-side "bevel" outlet cap,with DB Killer internal noise reduction insert. Fitment:Recommended fits for 250cc-up Street/Sport/Racing motorcycles. Note: This is an universal fitment muffler, please check the aplication before buying!